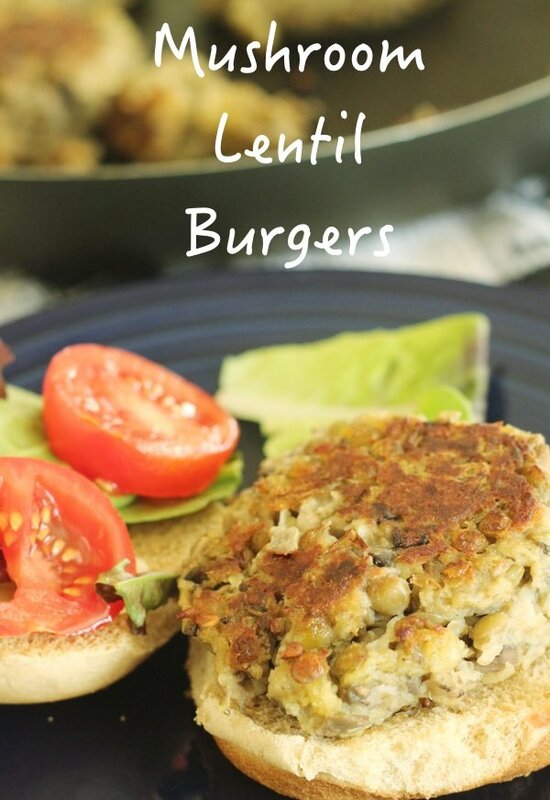 Mushroom lentil burgers are a very healthy replacement for 8 ounce beef burgers. I hope most of you consider a ½ pound burger to be a treat! 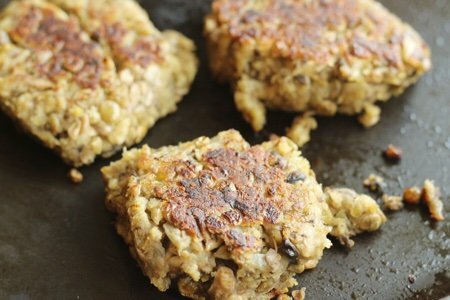 My mushroom lentil burgers feature beans which have been a theme of this website for a long time. My latest recipes tuna and bean salad and tomato and bean casserole feature canned beans that are precooked. This recipe features lentils which cook really quickly. It only takes 15 minutes of simmering to have perfect lentils. Take that – black beans! I happen to think lentils are meaty when done right. They are brown (which helps) and are an excellent substitute for ground beef when you are cooking for vegetarians. I used brown lentils for this recipe but any color or type would work. I think the brown ones look more attractive than the red ones for this particular burger. 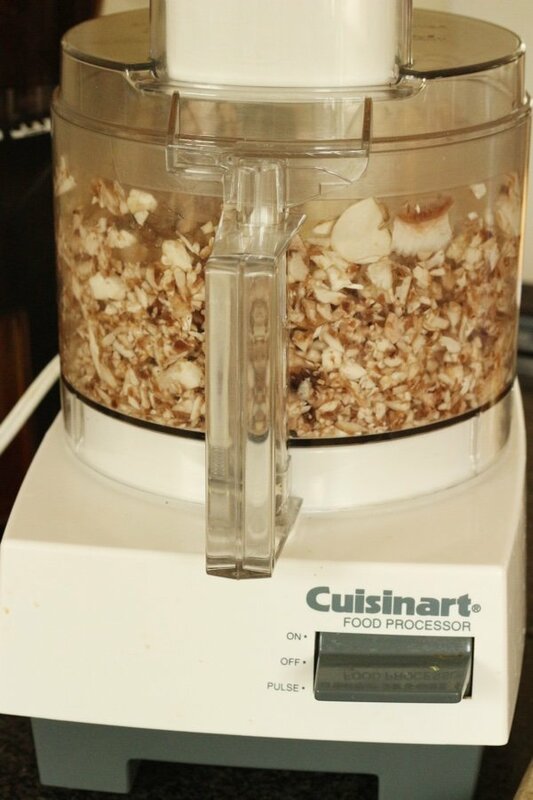 This recipe is perfect for your food processor. Since I have been begging you to buy one for the last 9 years, it is time for you to pick one up. The above is a photo of mine with the mushrooms for the recipe. This recipe is literally a whirl with this machine. I used it for the mushrooms, onions, garlic, and lentils. My Cuisinart is now 20 years old and still going strong. See it below on Amazon. This has a few steps more than I usually like to engage in but my daughter loves these. My mushroom lentil burgers are lower in sodium than many of the premade veggie burgers you can find in the freezer section. Once you get them made, they cook up fast. They do look kinda like meat though they don’t taste like it. I served these on whole wheat buns with lettuce, tomato, and Dijon mustard. If you want to make a batch to freeze, pan fry them, cool them and then wrap them individually in plastic wrap to eat whenever. They do get soggy so I would pan fry them again after they defrost to get that crunch back. Place lentils in a small saucepan with 1 1/2 cups of water. Bring to a boil, cover, and simmer for 15-20 minutes until tender. While lentils are cooking, add 1 tablespoon olive oil, mushrooms, onion, and garlic to a large skillet and saute until onions are translucent and mushrooms are a light brown (about 7minutes). 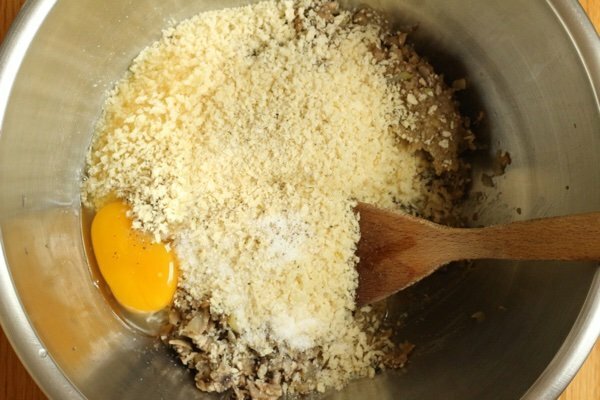 Place mushroom mixture in a large bowl. 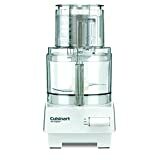 Puree ½ cup of the cooked lentils (you will have one cup total) in a food processor or blender. 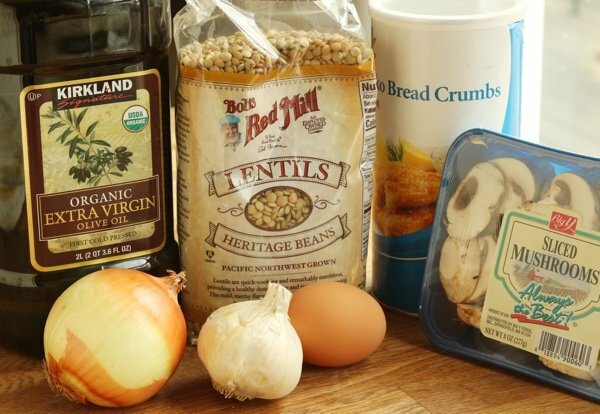 Add lentil puree and whole lentils to mushrooms along with bread crumbs, egg, salt and pepper. Mix and make into 8 patties. Refrigerate the patties on a plate wrapped in plastic wrap to help them set. 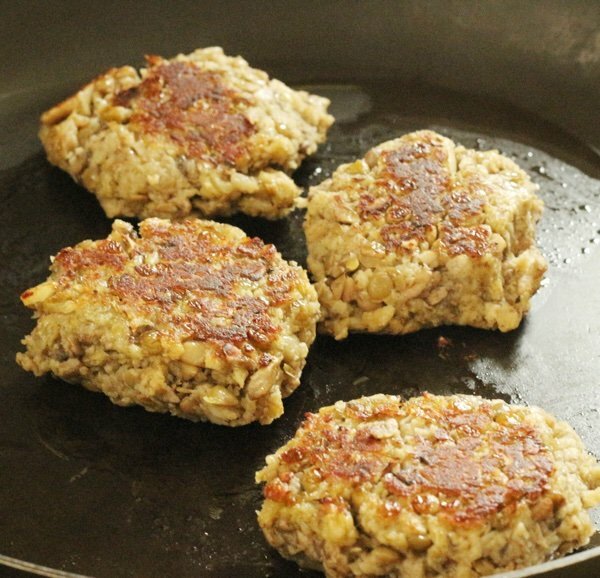 Heat a skillet with 1 tablespoon of olive oil and add the patties. Cook until crispy about 5 minutes per side. After you cook them, these patties freeze well. They look awesome! Got to try these. This looks like a recipe I would use....confused though add 1/2 cup pureed lentils and lentils to mushrooms? Is there more than 1/2 cup in the recipe? Thanks! What kind of lentils? Red, Brown or green? @KLV its 1/2 cup dry lentils as first ingredient. After cooking, puree 1/2 cup cooked lentils. Then you will still have more cooked lentils remaining. @KLV - I changed the description to be more clear. There are some whole lentils left over from cooking them. @Christiane - I used brown lentils but any lentil would work. Hey, thanks for a good low-sodium alternative. As a beer and burger guy trying to find a healthier diet, this sure helps! Also looking for suggestions for "simple" healthy low-sodium recipes. What I mainly find are things like "blackened tilapia with rice vinagrette served on Peruvian watercress". I mean, come on, I need something easier to stick with this. Nice recipe. I would add some brazil nuts for flavor, protein and vitamins. Think about adding 3 or 4 Brazil nuts. They are the highest in selenium which protect against cancer and various viruses and bacteria. "Brazil nuts are an excellent source of several B-vitamins, which range in functions from improving brain health to boosting the metabolism." Lisa do you use regular store-bought bread crumbs for this recipe? The canister label in the picture looks like it says panko. Please clarify. Thanks. These look delicious! I will love making them, but I'll add vegannaise to the bun and sliced pickles with the mustard, lettuce & tomato. Yummy! These look really good. I'm not a big fan of mushrooms, but I keep trying. Hi Lisa, I'm trying to watch my carbs so I tweaked this recipe a little. Instead of bread crumbs, I used crushed pork skins. I also switched out the olive oil for bacon grease. It gave the burger a "bacon burger" flavor and cut the carbs way back. Slap on some cheese and you've got a mock bacon cheeseburger. Thanks for all the great recipes. @Phyllis - I did use panko bread crumbs but I think any bread crumbs would work. Thank you for your question! I'm oil free, so would saute in water/broth. Do you think you could bake these in the oven on parchment covered sheet? Thanks! @Terri - I don't think they would get a crispy exterior without oil but they would hold together. Thanks for your question! I've made these crispy by coating with sesame seeds [or corn meal] and dry frying in non-stick or cast iron pan. They brown up nicely. Also I've had success with flax egg and cooked brown rice with fresh parsley [vs br crumbs]. I've played with spices like fennel powder and red pepper flakes too....very adaptable recipe! Do you think it will work with canned lentils? These look great! You can also buy precooked brown lentils at Trader Joe's vacuum packed in the refrigerator section.